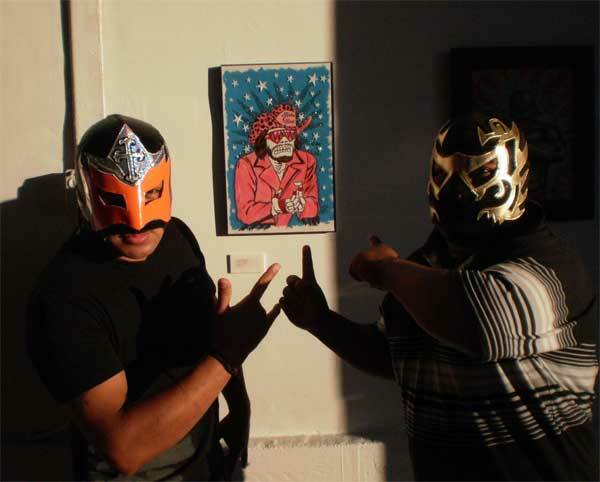 On Sunday, October 28, I attended the MUERTOMANIA 2 event held by Solidarity Ink, a print shop & gallery in the Lincoln Heights area of Los Angeles. 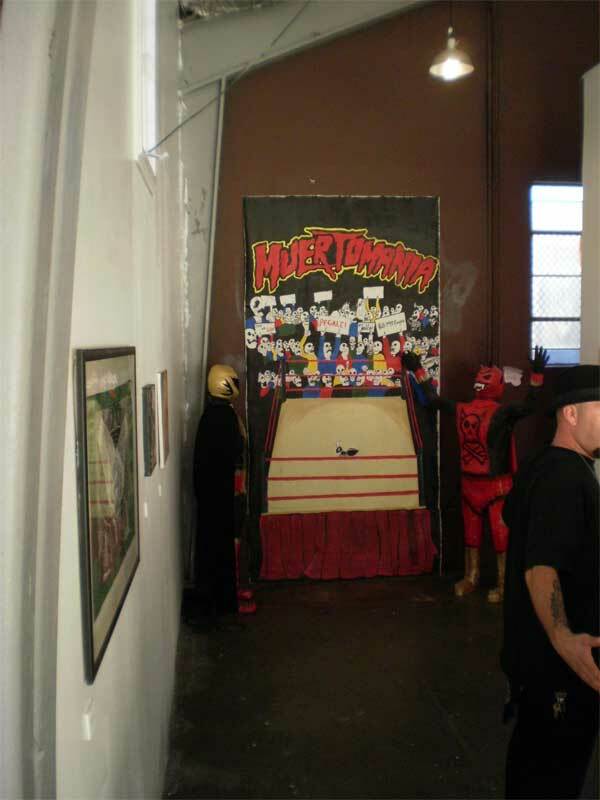 The event was held in their parking lot, with an art exhibit, dedicated to deceased wrestlers, taking place inside their gallery space. 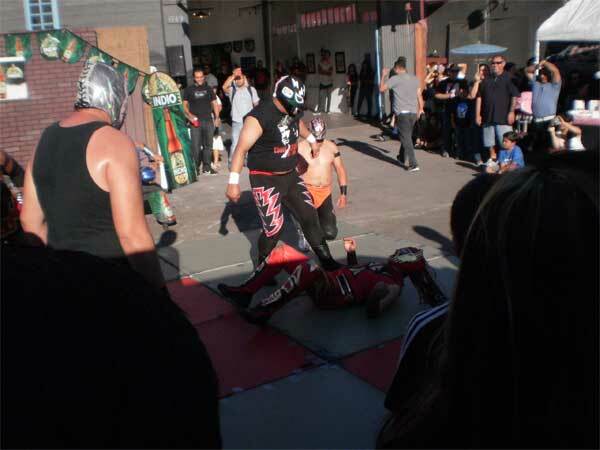 What made this event extra special was that they had live Lucha Libre, with a group of masked wrestlers performing several matches to an enthusiastic crowd. First time I ever had a booth with live wrestling occurring a few feet away! 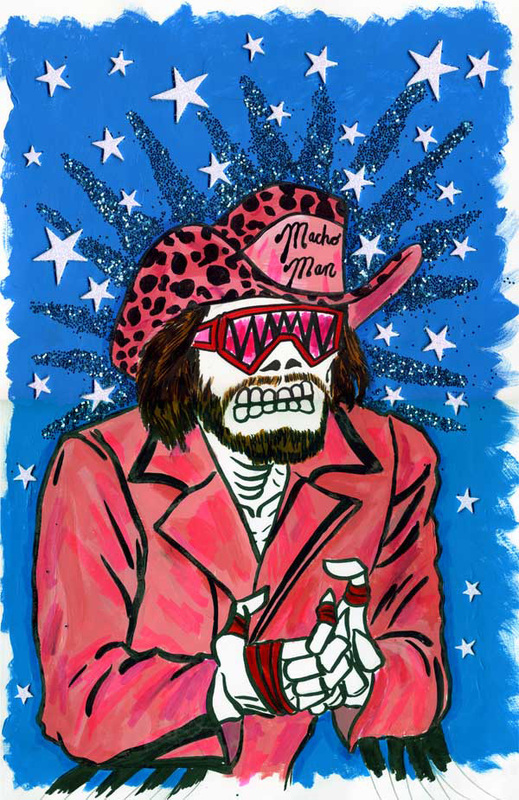 I contributed a piece to the art show, dedicated to one of my favorites, the late, great Macho Man Randy Savage! Throughout the day I had many great encounters with people . 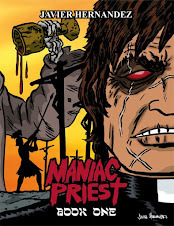 For some reason (but perhaps not surprising considering the demographics), my print and Poster Comic of THE WANDERING JEW & CATHOLIC BOY caught people's attention. One lady mentioned her son was making his First Communion, so that was the appeal for her. (I later realized I could launch a whole line of CATHOLIC BOY products for First Communion celebrants!) 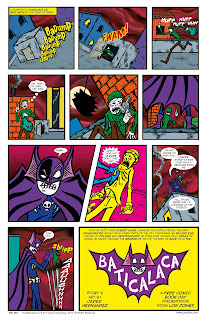 And another woman stopped by and bought the BATICALACA Poster Comic. She told me that her and her brother used to watch the BATMAN ANIMATED SERIES when growing up, and the Poster Comic reminded her of those good times with her brother. Later it crossed my mind that I didn't ask her if her brother was alive, but regardless, it's a nice feeling that something I created sparked a positive memory in someone. 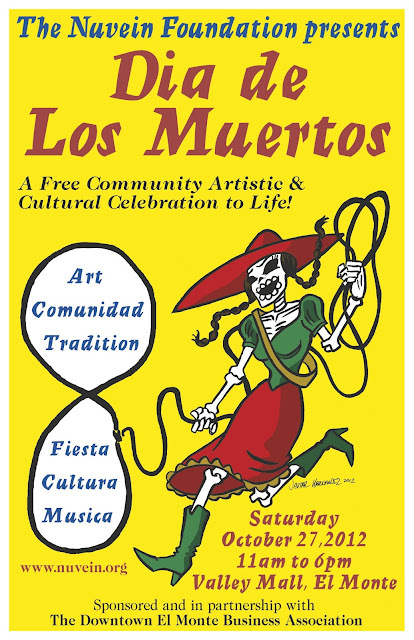 Like the NUVEIN DIA DE LOS MUERTOS (which I wrote about in Pt 1), this event was free to the public and promoted as an all-ages event. There were plenty of families visiting that day, with parents encouraging their children to celebrate this uniquely Mexican festival. I'm always glad to participate in events like these as I believe an appreciation of one's culture only adds to a person's character and outlook on life. A rare break in the day for Ernesto Vasquez, whose group, SOLIDARITY INK, organized the entire event. 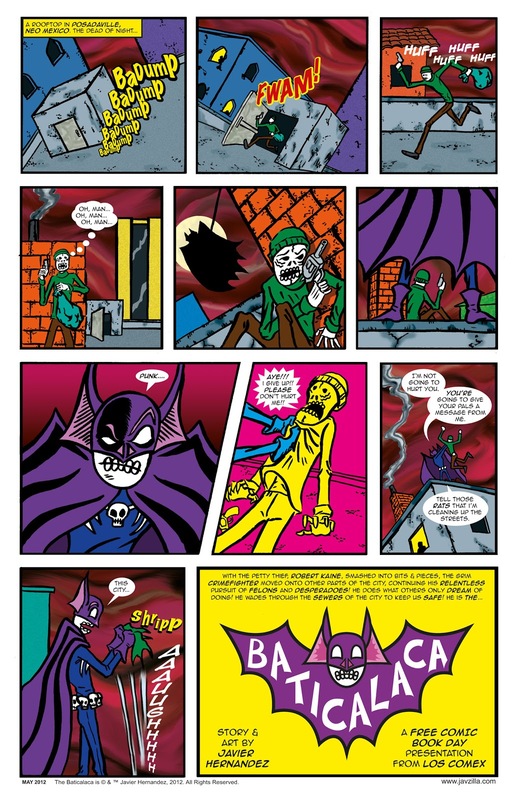 I met Ernesto some years ago at a comic book convention, and it's great to see him running this organization in addition to his own work as an artist. 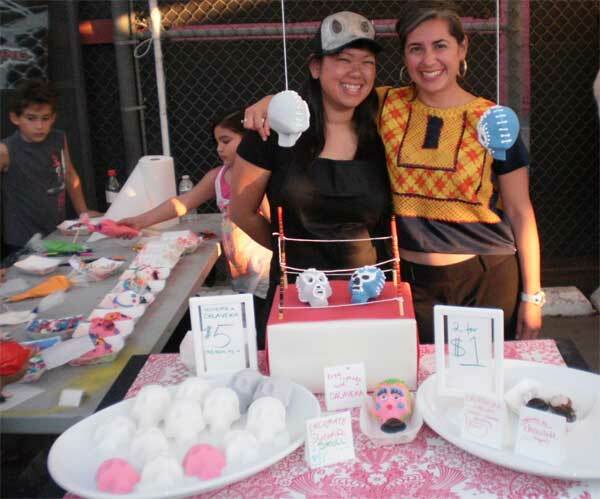 We talked about the struggles and rewards of running community arts organizations and also about the work involved in putting on events such as these Dia de Los Muertos festivals. 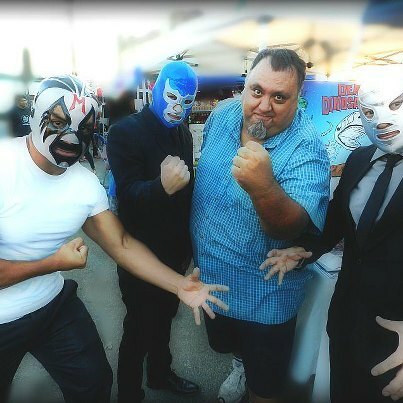 Me with a group of gents dresses as the trio of legendary luchadores: Mil Mascaras, Blue Demon & El Santo! 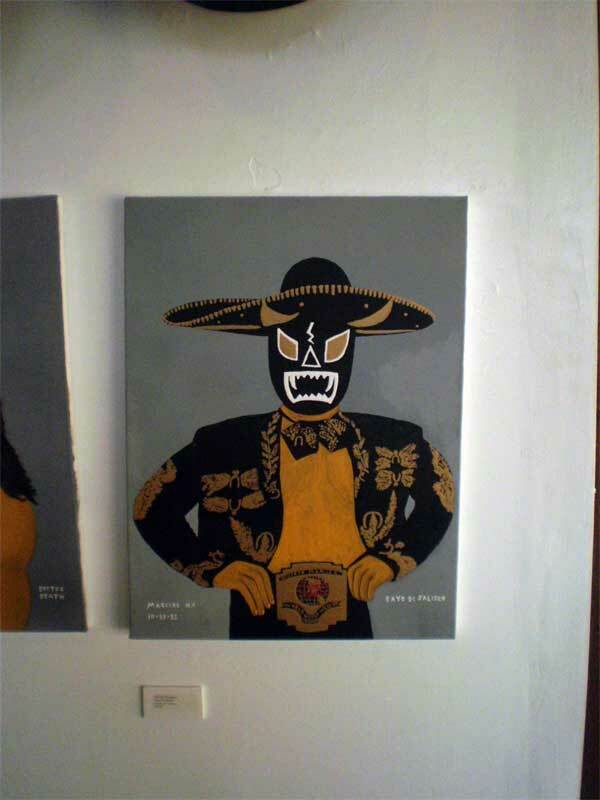 This event, with it's dual focus on Dia de Los Muertos and Lucha Libre, is one of the more unique ones I've had the pleasure of participating in. 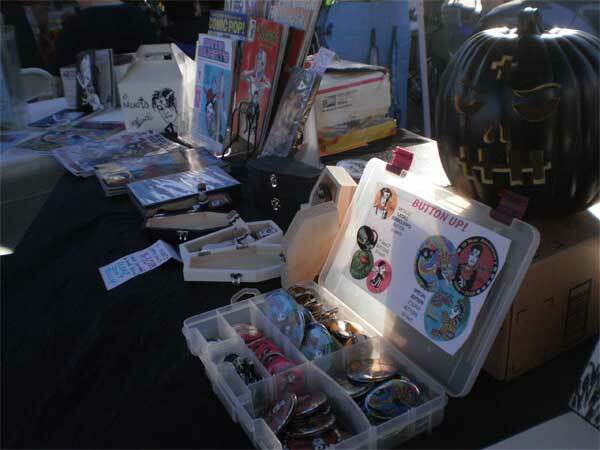 The staff, the other vendors, and especially the visitors, were all great people to meet. One of the kids (Abraham) who picked up a copy of DEAD DINOSAURIO would stop by once in a while to talk, he even came by to tell me he was leaving. What a class act! Later he came back to the booth, to my surprise. "I thought you were leaving", I told him. 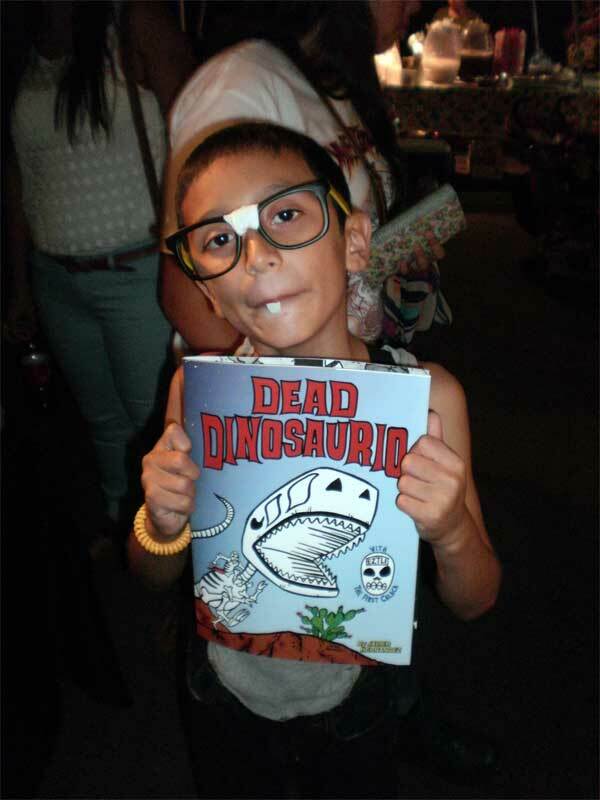 He said that he wanted to get another copy of DINOSAURIO, as he wanted to give one to his best friend! Abraham even stopped by once to show me part of his Halloween costume, NERD BOY! 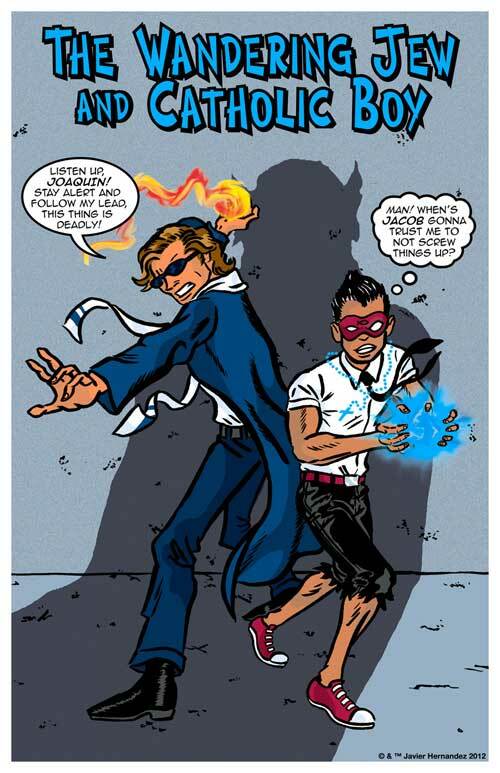 He said that maybe one day I could put that character in one of my comics, and I told him that he should make the comic himself. He liked that idea, and I encouraged him to work on it when he could. Like I've mentioned, I had a great time at these two events. 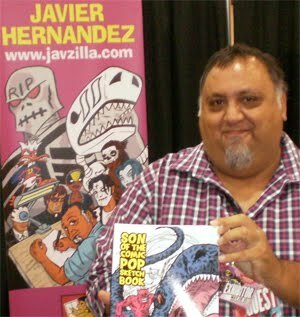 This coming weekend, November 3 & 4, I'll be at the Long Beach Comic Con. You can find me in the Small Press area at table #1400. 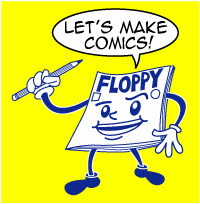 And I'll also be conducting a free "Let's Make Comics" workshop on Saturday from 12-12:45 in the Kid's Area. Thanks for reading. 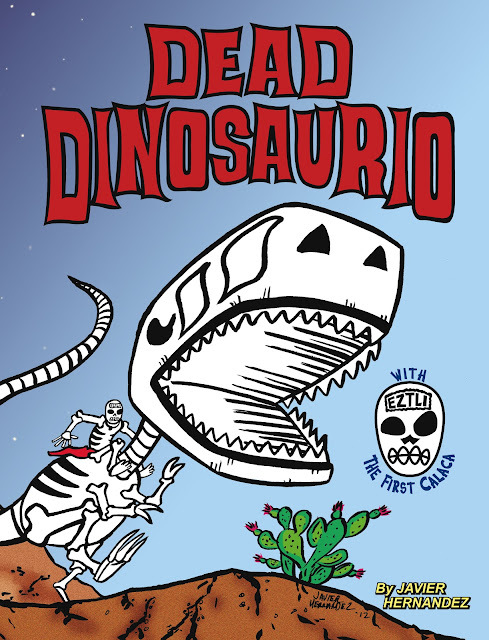 And if you'd like to buy your own copy of DEAD DINOSAURIO, please visit my Los Comex Web Shop. 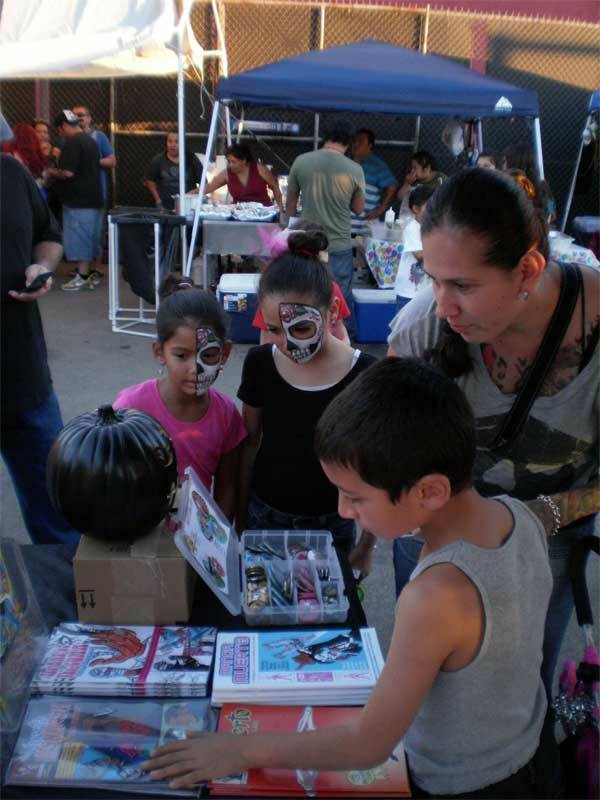 I participated in two separate Day of the Dead events this past weekend. Here are some photos and thoughts on Saturday's event. 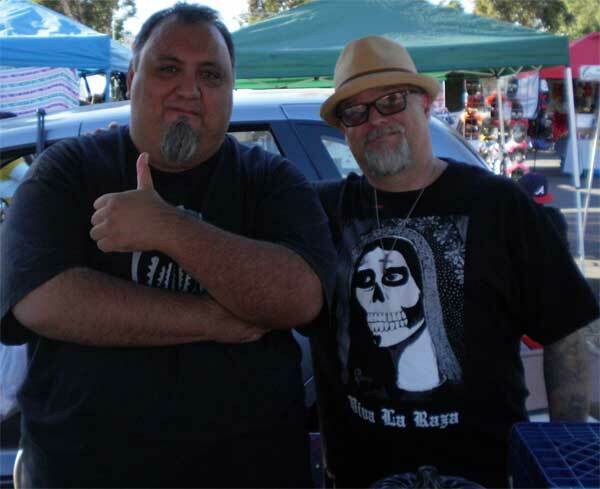 On Saturday I was in El Monte for THE NUVEIN DIA DE LOS MUERTOS. This was actually the 3rd year for that event, and it was organized by the non-profit arts advocacy group Nuvein Foundation (I'm on the Board of Directors). 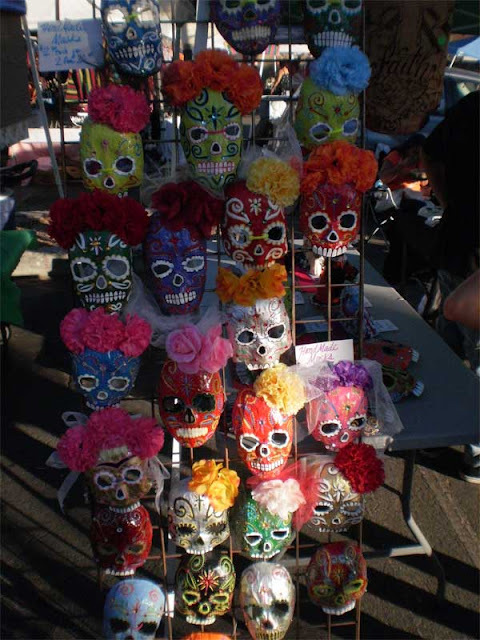 Our main focus is to celebrate the cultural event Dia de Los Muertos, the Mexican tradition of honoring loved ones who have passed away. 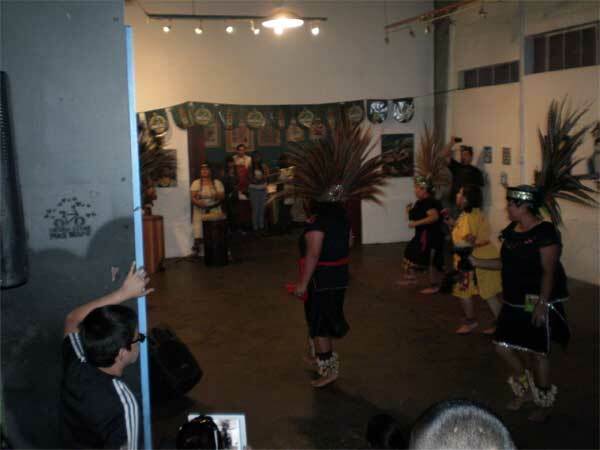 We provided a full day of entertainment by local artists, such as folkloric dancers, mariachis and other musicians. As this was our 3rd year, it's always nice seeing familiar faces. There was a young girl who came back to my table this year and she picked up DEAD DINOSAURIO. Her mom reminded me that last year she bought her daughter a copy of WEAPON TEX-MEX VS EL MUERTO! I told the little girl that it was very cool she was enjoying my books and that there was more to life than MY LITTLE PONY. She frowned when I mentioned that! Her mom laughed and said the her daughter didn't go in for that PONY stuff! 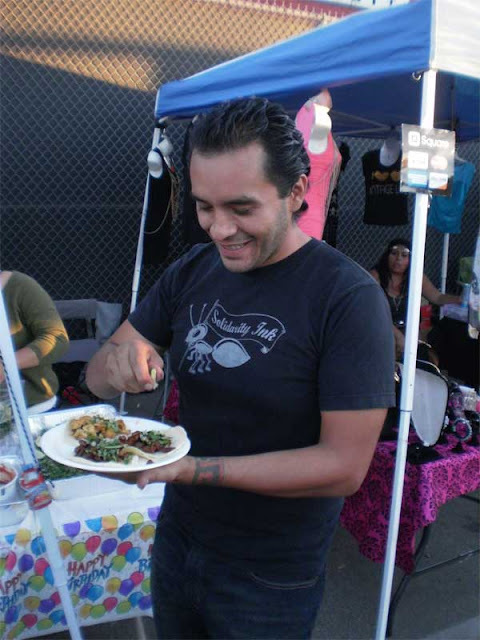 Last year, the founder of Nuvein, Enrique Diaz, passed away unexpectedly. Despite the tremendous personal loss to many of us, we've been able to continue his legacy of providing enriching cultural and artistic events to the local communities. I personally am committed to continuing working with the Foundation, and thank everyone who participates in these events. 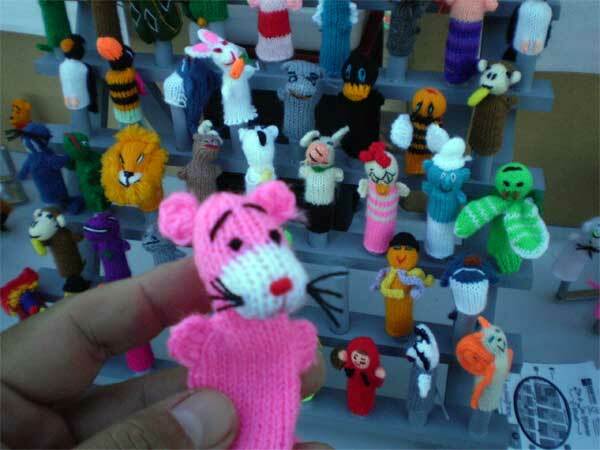 These hand-made finger puppets were made in Peru, by the mother of the lady who was running this booth. I had to purchase the Pink Panther for myself! Probably the biggest highlight for me that day was a visit by my friend Timo Curtiss. Timo and I actually met in Kindergarten and went through all 6 years of Elementary School together. We saw less of one another during our Middle and High School years, and pretty much went our separate paths for the following decades. It's only been recently, running into one another in the neighborhood, or via Facebook, that we've been able to reconnect. I invited Timo to spend the day with me at the Los Comex booth, the first time we've spent some quality time time since about 1978! He had some of his paintings in the art show we had running at the festival. We spent the day catching up on some 41 years of shared history and updating one another on our lives. Timo and I used to watch a lot of Lucha Libre as kids, and my Dad even took us to a couple of wrestling matches, at the famed Olympic Auditorium. We also talked about the trucks from Helms Bakery and a Mexican snow cone maker who would drive through our neighborhoods selling donuts and candy and Wacky Package trading cards! Man, some of my best memories are growing up as carefree kids reading comics, watching wrestling, playing and going to school together with great friends like Timo. 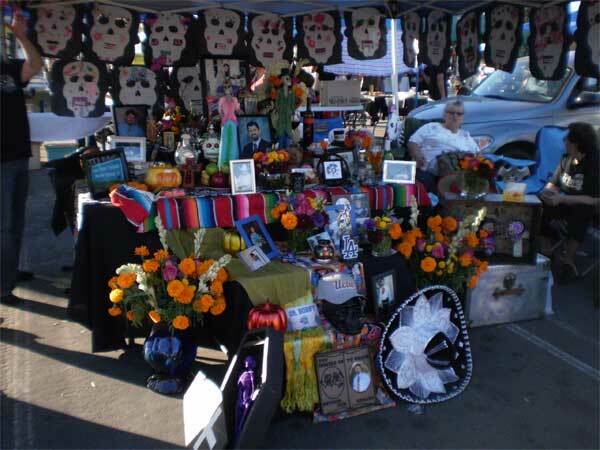 Dia de Los Muertos is about remembering our loved ones who've passed on. But it's also about celebrating life today, and the friends and family who are still with us. In Pt. 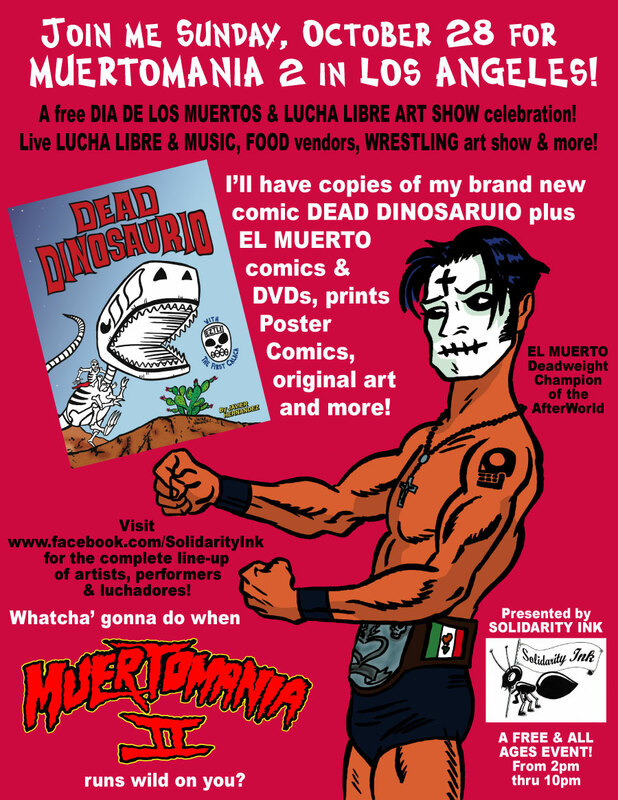 2, I'll share with you how I spent Sunday at MUERTOMANIA 2, a Dia de Los Muertos/Lucha Libre event! 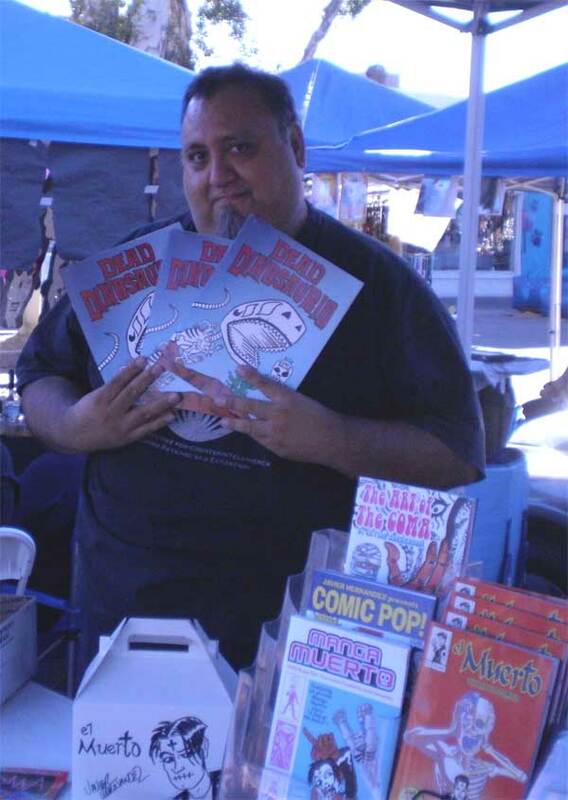 Just a reminder that this weekend I'll be appearing at two different DIA DE LOS MUERTOS events here in the Los Angeles area. 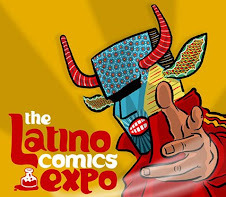 And my latest comic, DEAD DINOSAURIO, will premiere at these two events this weekend! 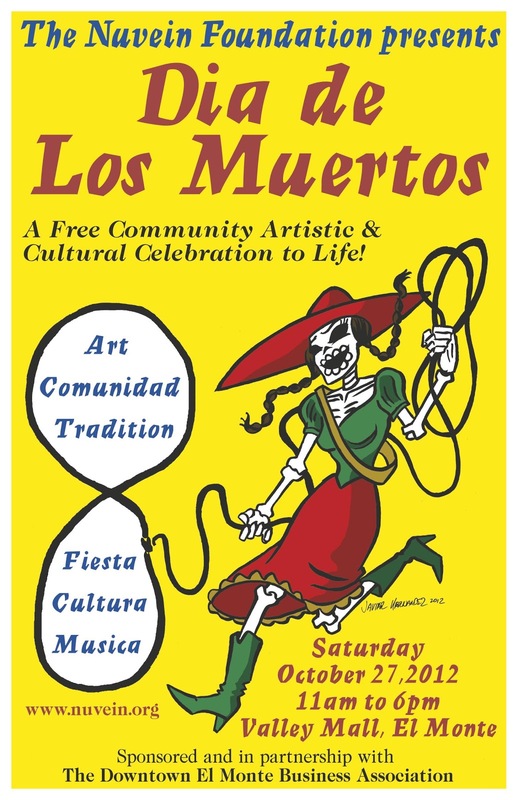 On Saturday, at the Valley Mall in El Monte, I'll be exhibiting at the NUVEIN FOUNDATION DIA DE LOS MUERTOS event. It's the annual celebration put on by the non-profit organization I've been working with for several years now. 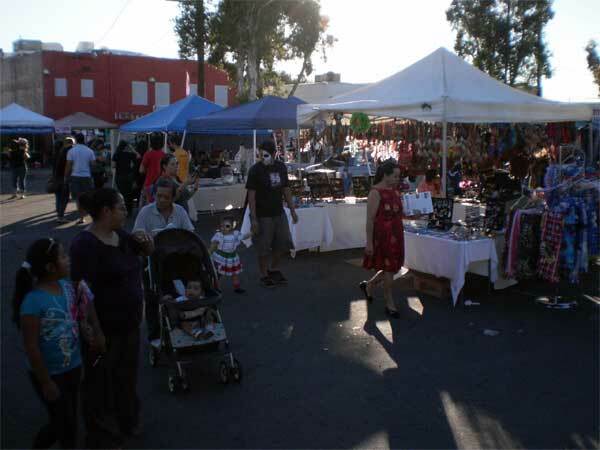 This is a free event for the community, featuring music, folkloric dancers and poetry, along with plenty of vendors. Check out our Facebook page for details. And my latest comic, DEAD DINOSAURIO, will premiere at these two events this weekend! 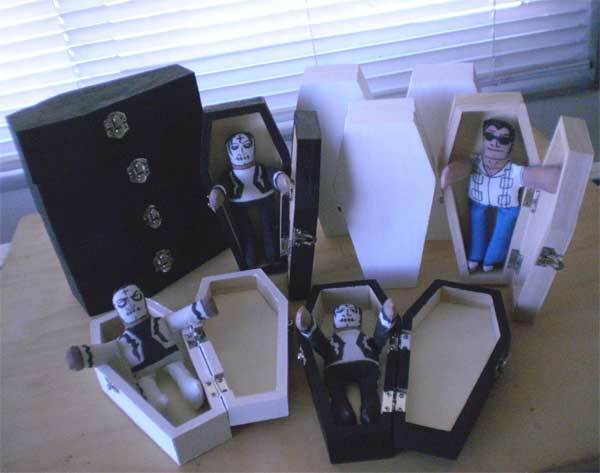 In addition to DEAD DINOSAURIO and my other comics and prints, I'll also have this new batch of EL MUERTO COFFIN DOLLS. 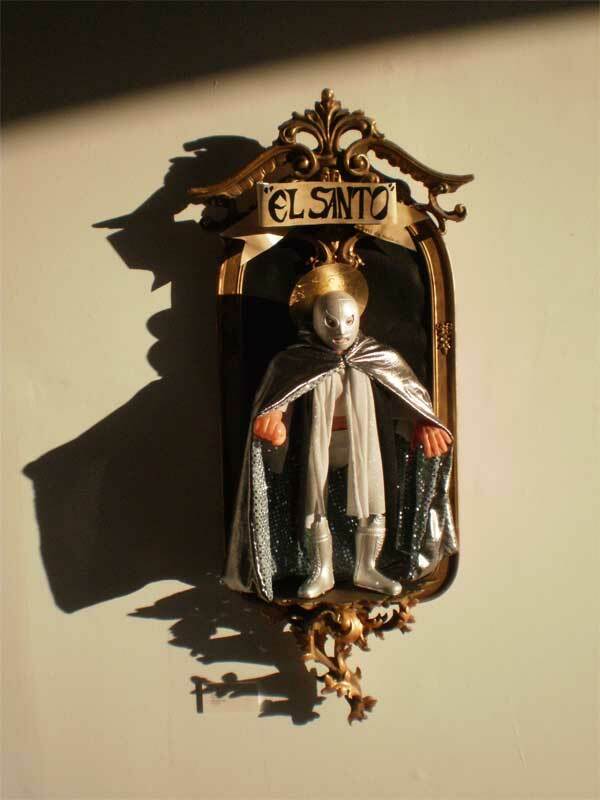 EL Muerto sketch dolls with hand-painted coffins! It's a big weekend and hope to see some of you out there. Dia de Los Muertos is, at heart, a true celebration of love for those that have passed on. Bring your family and friends to these free events and join in the festivities!